This is a beautiful set of 2 Rogaska Crystal small plates/dishes. Eight Italian crystal crescent-shaped plates. Two have "Colle" stamped on them. They have never been used. Up for your consideration is this vintage 14 piece beautifull crystal set with a gorgeous etched floral and cornucopia pattern. The stemmed glasses vary in size (see photos #9 & 10). This set is preowned but still in good condition. The plates however do have utensil marks which can be seen in photo #6 and one of the glasses has some flea bites on the rim, see photos #11 & 12. This vintage set will make a great addition to your collection. What's included: 6) Plates - 8" dia. 8) Cocktail Glasses - 6" tall x 4 1/4" rim Please keep in mind that these are vintage and were previously owned. So, some pieces may show some signs of wear, such as scratches/scuffs/utensil marks. It's a rarity to find an item that has absolutely no indication of use. This is a set of four Val St. Lambert Belgian crystal cake plates in the Intaglio design and signed with Val St. Lambert. They are also wonderful salad plates. The plates are in excellent condition. They measure about 6.5" diameter. Shipped with USPS Priority Mail. 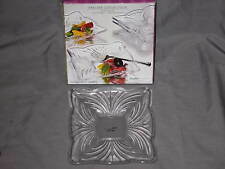 Here are some amazing Val St. Lambert crystal glass 8" salad/dessert plates. The 3D fruit pattern in the base is stunning how it catches the light. Some plates have a few light utensil marks and some chipping on the bottom rim edge (see picture). Plates measure a true 8" diameter. If you want fewer than 7 plates, send me a message and I am willing to split the lot. SHANNON CRYSTAL. 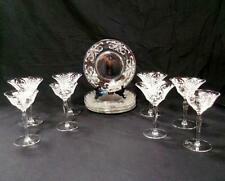 THIS IS A BEAUTIFUL SET OF CRYSTAL SALAD / DESSERT PLATES (NOT SURE OF THE PATTERN, BELIEVE IT IS DUBLIN). SALAD / DESSERT PLATES. New in box. Never used. In excellent condition. No chips or cracks. Handmade Heavy Cut Crystal Dessert Plate Poland ACC New with Tags 7 3/4"
Vintage 4 Crystal Serving Plate With Inlayed Fruit Design Pattern 8"
I described my item as best as I can. 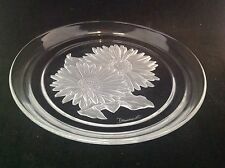 THIS IS A BEAUTIFUL SHANNON CRYSTAL HEAVY CAKE PLATE WITH THE LID. IT HAS THE ORIGINAL SHANNON STICKER IN THE PLATE AND IT IS IN EXCELLENT, UNUSED CONDITION. 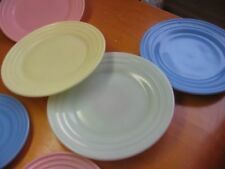 YOU ARE BUYING SEVEN ROGASKA HAMILTON SALAD PLATES IN EXCELLENT CONDITION. NO KNOWN DEFECTS. New, open box. Excellent condition. Val St. Lambert Belgian Crystal Glass Plates, Balmoral, 6" (Belgium, Saint). They do not appear to be used. The original stickers are beginning to fall off due to age. 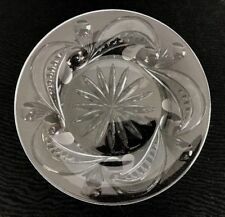 5 Beautiful Hoya Japan Crystal Etched Frosted Flower Leaves Salad Dessert Plates. These plates measure 7 1/4" in diameter and are in excellent condition with no damage, and minimal signs of use. Please view all pictures and ask any questions prior to bidding or purchase. Payment kindly requested within 48 Hours of auction end or item is subject to being relisted and reported. Thanks! The maker is "Rogaska". signed on the back. There are no utensil marks. The bottom of one of the plates is scuffed on the bottom. I think this one was on the bottom of the stack, and got slid across the shelf. Lot of 4 Clear Crystal Plates Diamond and Star Pattern 7"
• Beautiful Plates, for salad or desserts. • Very nice condition. Alexandria Crystal Clear 2 Tier Server With BOX. Looks like new. No damage at all. Must have addition to your collection. Shipping on this item will be free in the US. Thanks very much for looking at my stuff. Lot of 4 signed val st lambert crystal plates. estate find. 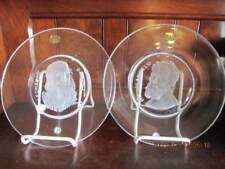 VTG Set of 2 Val St. Lambert 8" Crystal Fruit Plates Label Signed Belgium MINT! These 2 plates have a stunning cut and frosted design cut from the bottom side of the plate in the center featuring grapes, an apple and a pear with leaves. 4 Handmade Heavy Cut Crystal Dessert Plates Poland ACC New with Tags 7 3/4"
Mikasa Crystal Footed Cake plate. Made in Germany. "This is a used piece and shows visible signs of wear and use. Small flea bite rough spot on bottom side bottom ring rim along outer edge-not particularly visible but can be felt. We're happy to respond based on what we know and can observe. PAIR OF TWO FROSTED CRYSTAL FLOWER PLATE by Hoya Fine Crystals, Japan. 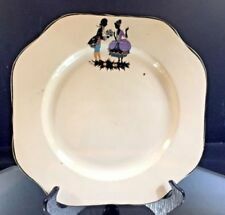 FOUR Val St Lambert STATE PLAIN w/RAYS Crescent Salad Plates -EXCELLENT! Made in Belgium by Val St Lambert, this set of four crescent shaped plates are stunning with the cut rays. Ideal as salad plates but also great as appetizer dishes, relish plates or as dessert dishes. Elegant four-section relish dish. Stands on pedestal. Made in France. Beautiful piece and in excellent condition. Set of Six 6 Vintage Cut Etched Glass Lead Crystal Plate Dishes 8"
Very little usage and wear. Height: 1 3/4". No labels or markings. FYI … photos make the ice area of the plate look black but the plates are frosted and clear glass (that's just the black background). 4 VINTAGE FAN & CRISS CROSS PATTERN CUT CRYSTAL SALAD LUNCHEON PLATES 6 1/4"
They are beautifully cut with a fan & criss-cross pattern. 1991 ST Patrick's Day Galway Irish Crystal Plate ~ 24% Lead Crystal COA Ltd Ed. This is a "Limited Edition" piece, number "775 of 1000". 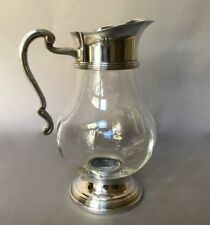 This is a beautiful piece of Irish Cut Glass and would make a significant addition to any Irish cut glass collection or any other fine cut glass collection. For your consideration are these delightful crescent shaped salad plates made by Val Saint Lambert of Belgium in the Nicole pattern. These are from a giftware line. These plates have a wide “diamond point” edge and then cut ray pattern on the face of the plate.